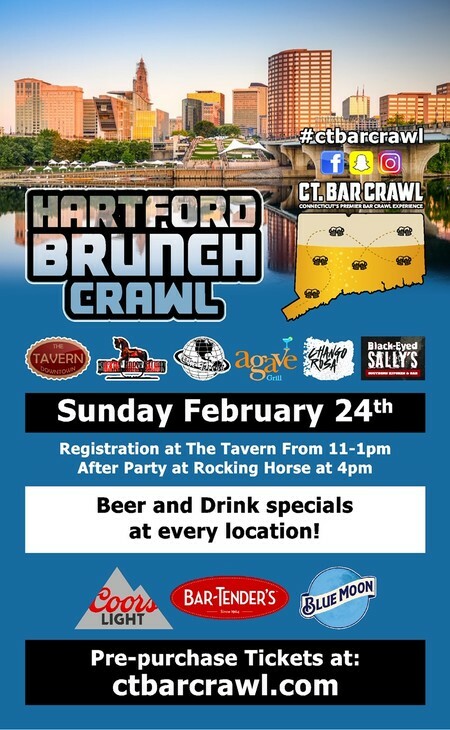 Come join us for the first ever Capital City Brunch Crawl! Come hop bar to bar and party with us in Downtown Hartford! We’ll visit multiple venues in one day, with exclusive perks including drink specials, brunch food specials, express entry, and no cover charges. We will take you to the hottest bars to party at featuring CT’s best DJs! Meet our tour hosts at the first venue on the lineup to register and check in, mingle with fellow partygoers, and partake in our exclusive drink specials. Then as a group, we’re off to our second venue, where the drink specials and partying continues! Must be 21+ with a government-issued ID to attend. Street parking is free on Sundays in Hartford, there are also several parking lots and garages nearby for affordable rates. Please feel free to reach out to us if you need any assistance in finding parking. Tickets are required to participate in this event. It costs us money to run the event, including cost for the permit, staffing, and we rent out each participating venue for a certain time. We also book DJs, negotiate drink/food specials,, provide swag and much more. You can print or we can scan your ticket on your phone. Must be 21+ in order to attend this event! LATE CHECKIN IS AVAILABLE. We will have staff members at each venue so you are allowed to join in at any point in the crawl!